John Zimmer's colourful My Self-Defense Blog is one of the best in the world on the subject of martial arts. I have once again been asked to provide a guest post at another blog. This time, John Zimmer over at My Self-Defense Blog selected my article about the effectiveness of grappling/BJJ against multiple attackers. The post is now live at Grappling/BJJ Against Multiple Attackers; Is it Effective? 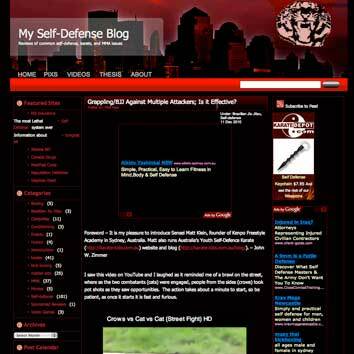 John’s blog is one of the best in the world in the area of self defense and martial arts. His colourful stories about his experience as a bouncer and tournament fighter make his blog a great read for all martial artists. He is one guy that “walks the walk”, and was on the Tracy/American Kenpo Karate fighting team in the bad old days. For all you Kenpo people out there, it is a good find for some history of the Tracy branch of American Kenpo, with many of the legends and their exploits explained in great detail. Check out this page in particular. Kenpo History and Discussion. This is one subject that gets people fired up, the discussion of grappling vs. stand-up fighting; everyone has strong opinions about it. It is sure to be an interesting topic, so please get in there and throw your opinion in the ring. All opinions are respected on John’s blog, and it does not matter if you agree with me or not. As always, I appreciate your support. 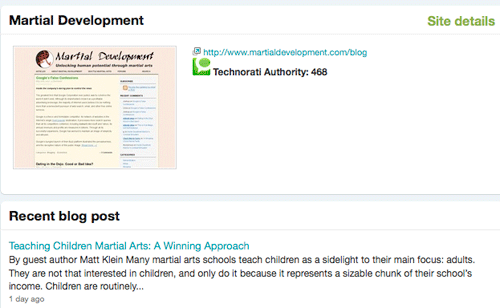 Martial development is one of the most successful blogs on the web. One of the most successful martial arts blogs on the internet, Martial Development has asked me to do a guest blog. It just appeared this morning. The post entitled “Teaching Children Martial Arts: A Winning Approach”, explores the differences between teaching martial arts to children and adults. Differences include children’s learning ability, exercise capacity, sparring classes, discipline, and motivation. It is a very good article to read for any instructor who teaches children.